Before arcade shooter Centipede: Infestation gets released on the Wii and 3DS later this year, Atari would like to open our eyes to the types of bugs we'll be disposing of via a trailer aptly named, "Bugs Trailer". Players will take on the role of Max as they travel the wasteland that the planet has become and protect a young girl called Maisy, whose garden could be the key to saving the world. Not only will the game contain enough creepy crawlies that will make most minor celebrities scream: "Get me out of here! ", Centipede: Infestation will also feature a selection of weapons that players must utilise if Maisy's garden is to be protected. Armed with weapons that come with intimidating names like the Lightning Orb Gun, Nuke Cannon, Freezethrower, and Mine Launcher, Max will have to flex that trigger finger like there's no tomorrow if he is to exterminate the giant mutated centipedes, spiders, beetles, grubs, caterpillars and perhaps the most annoying of all, moths. Everybody hates moths, right? 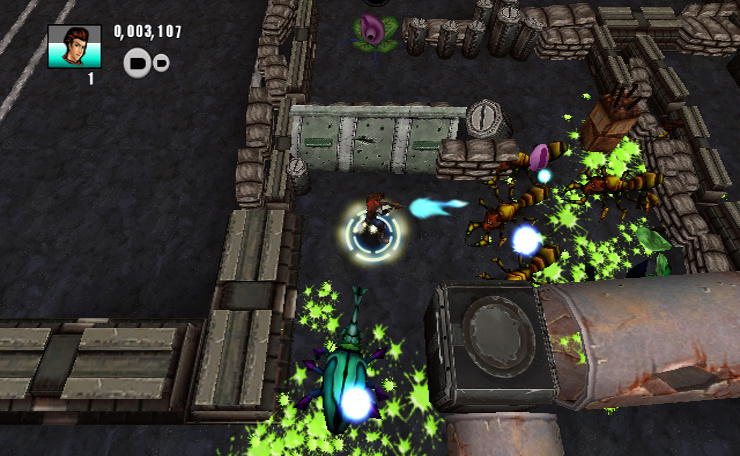 The bodies of dead bugs can also be used to create power-ups and new defences such as turret guns and barricades. 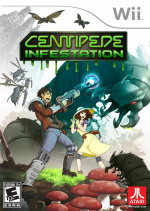 Centipede: Infestation is scheduled for a Wii and 3DS release this Fall. looks pretty cool, but it's not centipede. why call it that, even? I guess name recognition goes a long way. I like the "smash TV" feel of it. Looks like multi-player would be a blast. That's a retail game? Yikes. And people wonder why the iOS is killing handheld gaming. This looks like it would be maybe 5 bucks on the app store. 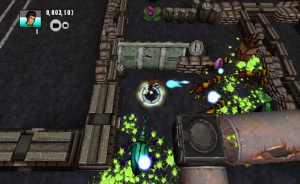 Looks like a cheap version of Team17's Alien Breed games. Those are awesome. This? Probably not so much. I hope the game is not too buggy. Also I have Alien Breed 2 but haven't played it yet. Maybe I should. This game looks like junk compared to just about any similar game. It should be noted that this is being made by Wayforward. I think it looks pretty fun everybody stop being so dang picky. Don't judge the game until you actually play it. @Oddy: You have it and haven't played it too? Me niether. Did you get it free during the Steam Summer Camp like me? So...it's "Gungeon Crawler" meets Buck Bumble. This looks like it could be a DS game. >:[ No sale. I wouldn't say it looks terrible by any means. I'm not exactly excited about it but I don't see any reason to start mocking this thing yet. It actually looks really fun. Reminds me of the minigame on CoD: Black Ops in Nazi Zombies. Will be keeping my out for this actually. @Ren Exactly what I was thinking. Seeing this video intrigues me to the possibilities. We'll see. So looking forward to this one, I am going to get this on the Wii. Isn't Wayforward or High Voltage developing this one? "I hope the game isn't very buggy"
I think I'll just stick with 2600 Centipede. Eh, I'll probably give it a rent. It looks more like something like Alien Syndrome rather than Centipede but what ever. I don't get what the gripes are about. this isn't supposed to be a photo-realistic, thinkers game, it's a free for all blaster thing and looks fun as such. what a bunch of whiners. Yeah i'll be picking this one up day one me thinks (really it depends when its coming out). @Ren Here's a whinge for you - Alien Breed is better. Oh, and it isn't a photorealistic, thinkers game, either. It's just better. I had so much fun with Crimson land or Alien breed. but they were much MUCH less than a 40-45 dollar retail game. the kind of game i would really like to play, but as an eshop title. for 5-10 dollars. So much 3DS titles i wanna try, so much feel like eshop titles. please devs, take the 3ds as a console, not as a freaking iphone. ill wait for reviews and if nintendo is nice with us, a demo. not a day one buy, but it still goes on my list for the fun factor. Because shooting stuff is always fun. I am a pretty big fan of WayForward's games but this one does absolutely nothing for me.